Last week we discussed the phrase “to get the door”. It means to answer the door when someone is at the door. But the phrase “to get the door’, or any phrase actually, can mean different things in different contexts. For example, in the movie “He’s Just Not That Into You”, a club manager is in his office with a waitress. She leaves the office without closing the door and the manager yells at her, “Get the door! Get the door!” In this situation, what the waitress is expected to do is not to answer the door but to close the door. Here’s another example. You see a woman pushing a buggy and trying to open the door. If you want to help her, you can say, “Let me get the door for you”. To get the door in this case means to open or close or hold the door for someone. Let me get the door for you. 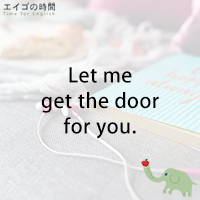 Next Post Let meの使い方 – Let me help you.